The Orkut has added some wonderful new features. 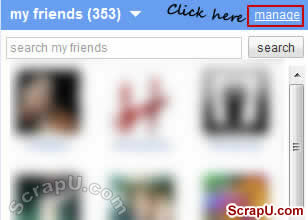 Now you can send scraps and image scraps to "All You Friends" with just one click. To send scraps to all, create a group including all your friends in that. 1. To create a group click "manage" (you'll notice it just above your friend list). See the Image - 1 below. 2. A new link "create new group" will appear on the left side of your profile, click on it and name your group and save it, now you can add friends of your choice in that. See the Image - 2 below. 3. If you wish to send a scrap to one particular group then just click on that group then click on "html"(you will see this above the reply box) and paste your scrap or image code in reply box. Now only the member of that group will see that scrap and no one else. So dont forget to wish all your friends on festivals.